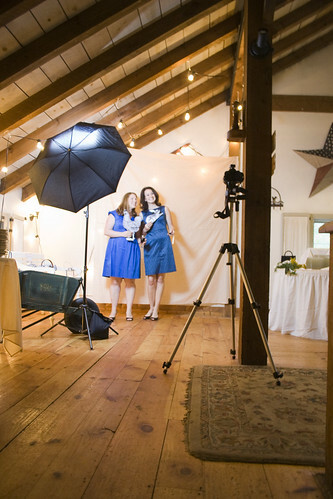 This summer I had the pleasure of working with a dear friend on some projects for her wedding reception. I used vintage illustrations, hand-lettering, and a palette of antique-hued fabrics to create table numbers, signs, and a hand-made photobooth. Take a look! For the seating chart, we used a 12 paned window frame that belonged to the bride - how perfect that the guests fit at 12 tables! 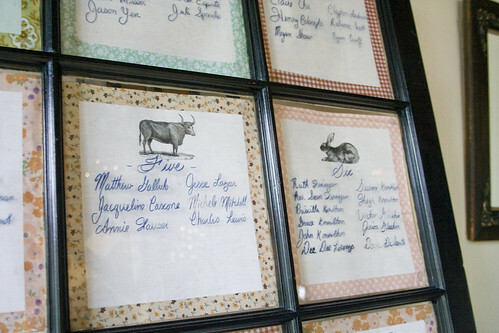 Paper backings were attached to the back side of each pane, and the bride wrote on the front of each pane with a glass marker. 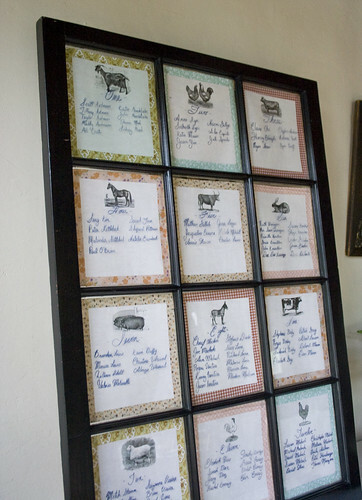 I designed the paper backings with a vintage farm animal illustrations to identify each table, and borders of my favorite vintage-inspired fabric patterns. 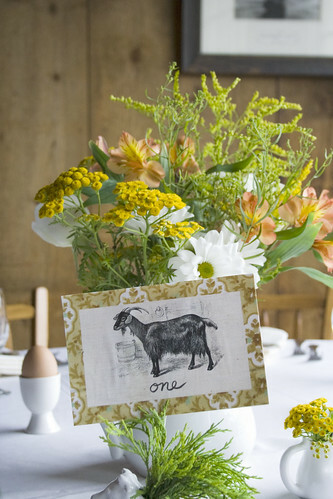 This sign invited guests to bring one of the cow creamers or egg cups that decorated the reception home with them. Another friend of the bride created sweetly packaged wildflower seed favors. 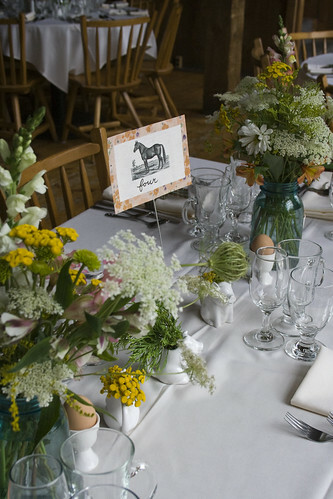 Each table was marked with a card featuring a vintage farm animal illustration and a patterned border that corresponded with the table seating chart. The flower arrangements were created by the bride's mother- aren't they beautiful? 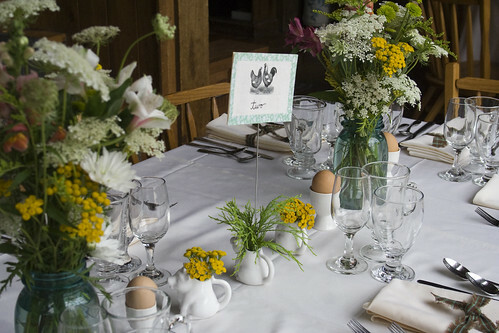 White ceramic cow creamers worked perfectly to display the table cards and hold tiny wildflower blossoms. 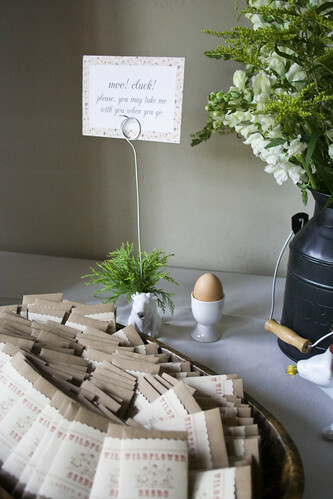 Brown eggs in little egg cups also dotted the tables - the bride and groom are both chefs so baking and cooking details were used throughout the reception. I can't get over how lovely these flower arrangements were! The colors tied in perfectly. 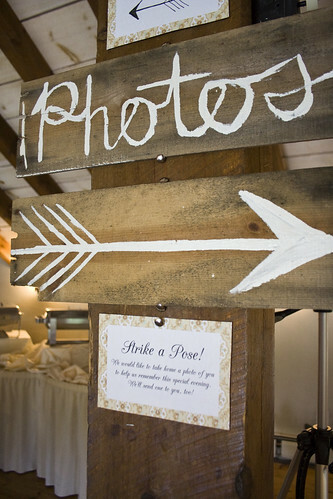 More hand painted signs and printed cards helped guests find their way around the multi-leveled barn that housed the reception. The wooden pieces for these signs were salvaged from old crates and boxes. Do you recognize this chicken? Some of the animals from the table cards made their way into our hand-made photobooth. 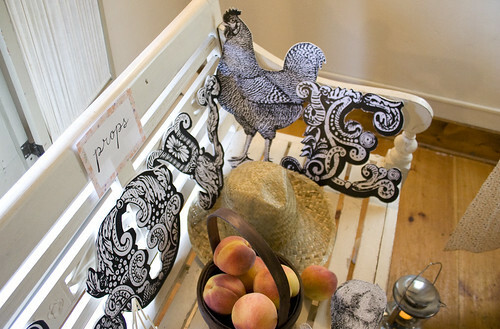 Large printouts of chickens, rabbits, and "L-O-V-E" letters were mounted on sturdy foamcore. Other props included old-fashioned lanterns, a wooden wheelbarrow, hats, and baskets of peaches. The backdrop was made with one of the fabrics that was used on the table number borders. Two guests gave the photobooth a try - hooray, it works! 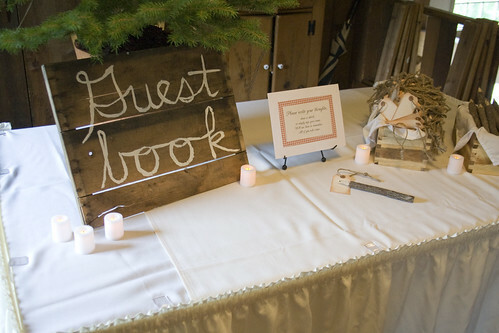 The groom had this great idea for an unconventional guest book; guests were invited to write on a tag and hang it on a tiny Christmas tree from the couple's home. By the end of the night the tree was filled with well-wishes and love from their friends and family. 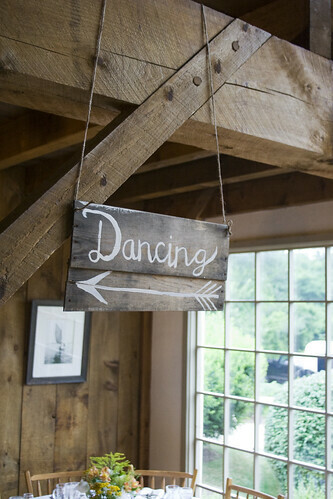 This sign pointed up the stairs from the lower level of the barn, where dinner was served, to the dance floor on the upper level. Here's an overview of the space from the loft area. 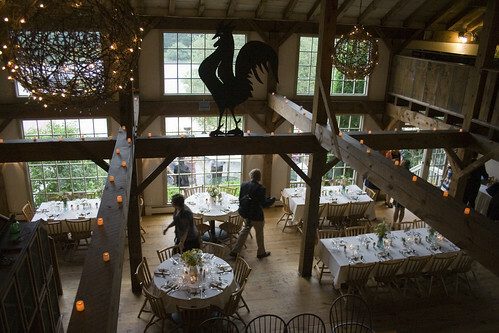 The entire reception was lovingly decorated by friends and family of the couple. It was a beautiful celebration of a beautiful couple. Congrats!